Don't be alarmed. Samsung's leadership is launching a religious movement, but its goal isn't to change everything you believe about good, evil or the meaning of life. It simply wants control of all your mobile platform needs. It's an ambitious plan, and Samsung needs true believers--an army of street soldiers who can evangelize the mission, and indoctrinate new converts. The company began assembling the ranks when it introduced Samsung Apps, its own Android app store, with the release of the Galaxy S4 smartphone earlier this year. And to further increase its headcount, the company held its first annual Samsung Developers Conference this week in San Francisco to entice start-ups and indie developers to build apps specifically for Samsung devices. The goal wasn't just to evangelize and showcase what the company has accomplished with its partnerships, but also to demonstrate that Samsung is serious about building its own full-fledged app ecosystem--a marketplace it wants you to visit before you drop into Google Play. The world has gone app store crazy, and Samsung would be damned if it has to play second fiddle to anyone. And it really doesn't have to, since it already has a solid hardware foundation built on every imaginable phone and tablet screen size from the 4.3-inch Galaxy S4 Mini to the 6.3-inch Galaxy Mega to the 10.1-inch Galaxy Note 10.1. At this point, Samsung really only needs to increase its flock of developers. Hence the recruiting drive at the Samsung Developers Conference. It's the one true path to mobile salvation. In its conference keynote, Samsung hit developers with two compelling arguments in support of native app development: The company has tremendous reach around the world, including footholds in China, Southeast Asia, Japan, and Australia, and it's also the number one smartphone maker in most of those markets. The message resonated with Matt Nutt, VP of Business Development and Operations of Cie Games, an independent mobile game company that was featured as a part of an introductory video during the keynote. "They do have many devices, but they're doing a lot to reduce the fragmentation of devices in terms of share on the Android marketplace," Nutt told TechHive. "[We can't ignore] any opportunities to leverage the marketing prowess of somebody like Samsung." If developers take advantage of the SDKs, it means you'll find more features and apps for your Samsung devices--along with more incentive for you, the consumer, to stick with Samsung hardware. And it's all a blueprint for ecosystem propagation, where software boosts hardware sales, and hardware sales give life to more software downloads. Connect all the dots, and it begins to seem amazing that Samsung is only holding its first developer's conference in 2013. Take Samsung's ChatON messaging applications, which let users chat with one another across all mobile and desktop platforms, send group messages, and chat in other languages with an auto-translate function. While Google has added features like SMS messaging to its Hangouts app, Android is still behind in features when compared to iOS's iMessage, and Hangouts is only usable between the web and Android devices. Google Wallet must also play catch-up to match Samsung's Wallet 2.0, which borrows much of its aesthetic and functionality from Apple's Passbook. Samsung's mobile payments app was released earlier this year on the Google Play store with features like the ability to store loyalty and gift cards (which Google just recently took out of its Wallet app). Samsung's wallet app also enables geo-fencing for coupons to pop up when you're near a store. Samsung's app is also available to users overseas, while Google's services are still limited to the United States, and only from specific carriers, like Sprint and US Cellular (which aren't a part of the Isis mobile payment alliance formed by AT&T, Verizon, and T-Mobile). While Samsung's in-house app development team may not match Google's in size, it can still get developers with great ideas to work on features that Google doesn't offer. Case in point: Samsung has partnered with Rabbit, an online video platform that lets you not only video chat with friends, but also watch video with them on external services like Hulu--all in real-time from your computer and (in due time) mobile devices. The upshot is that Rabbit will be featured front-and-center on Samsung hardware, and its neat features might make you consider it over Google's own video-chat services on Android. Rabbit also trumps Google Hangouts in group conversations by allowing up to 20 people to chat in a room. 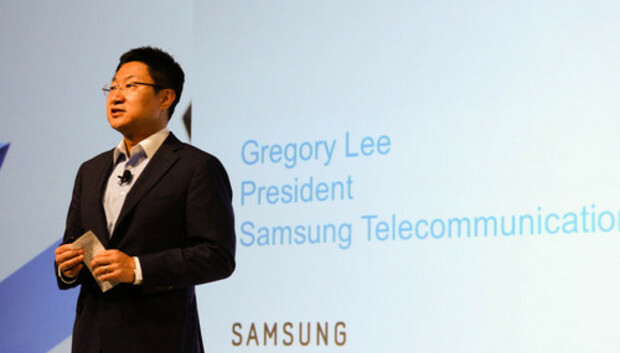 At the beginning of his Monday keynote, Gregory Lee, President of Samsung Telecommunications of America, was excited. "We never expected a big crowd," he told the audience. "We expected a small one." According to Nicholas Reichenbach, co-founder and president of Rabbit, there's a reason for the positive turnout. "Samsung's marketshare had a lot to do with the attendance," he said in a phone call. "Whatever Samsung is doing is very attractive to developers." And what can be more "attractive" to an up-and-coming app developers than sales revenue? As smartphone users, we often scoff at the apps that device manufacturers load on our phones. And we often bristle when we're asked to visit yet another app marketplace, when we already have Google Play. But Reichenbach says one of the key attractions of Samsung Apps is that developers are seeing better monetization through Samsung's mobile products. "It's always been difficult to monetize [on the Android] platform," he says, "but with Samsung devices, we're starting to see the monetization equal to other platforms." And since Samsung's high unit sales means it has more marketshare, app developers have more chances to make more money. "It's starting to grow--potentially even greater than other platforms that are leading the market," Reichenbach says. With more than 1,300 attendees at this week's conference, it's obvious there are at least a few developers who are interested in building for Samsung's ecosystem. Indeed, Samsung can offer small, independent developers something that Google can't right now: Prominent positioning in an app store that's a lot less crowded than Google Play. So one can see why so many lost souls are interested in joining the Samsung effort. But where Samsung could really have a winning hand is not in courting small, independent developers, but in striking exclusive deals with big-name app powerhouses. It's already teamed up with triple-A app developers like Twitter and Flipboard, and similar deals could compel you to buy the next Galaxy phone instead of a handset from HTC. But maybe that's the point. You can only have one religion--and Samsung wants to be yours.